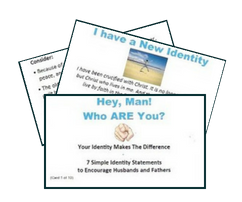 Ten business sized cards with identity statements, scripture verses, and application questions. Simple. Fast. Spiritually energizing. Keep them near your Bible, in your pocket or in your desk drawer. Three complete sets for sharing.